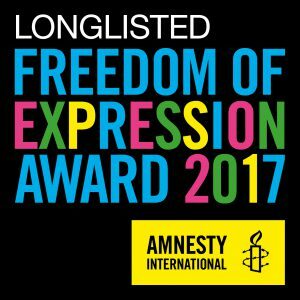 We are delighted to announce that A Machine they’re Secretly Building has been long-listed for the Amnesty International Freedom of Expression Award 2017. The Freedom of Expression Award honours an Edinburgh Festival Fringe theatre production of excellent artistic merit that builds understanding and raises awareness about human rights in an inspirational way. Around 70 long-listed productions are reviewed by a team of volunteer reviewers and a panel of professional theatre critics, ahead of an award ceremony where the winning and shortlisted shows are celebrated. The full long-list can be found here and we are incredibly honoured that the show is being considered amongst them.